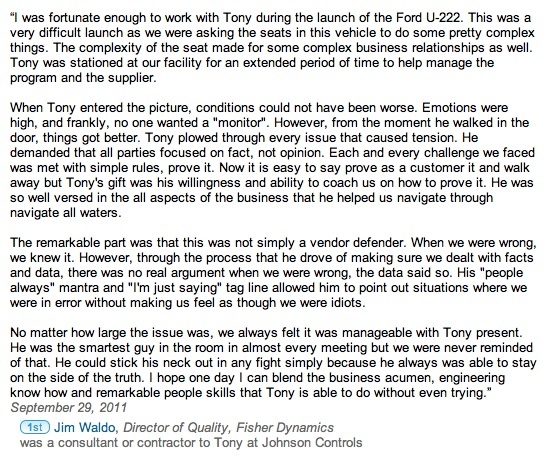 “I was fortunate enough to work with Tony during the launch of the Ford U-222. This was a very difficult launch as we were asking the seats in this vehicle to do some pretty complex things. The complexity of the seat made for some complex business relationships as well. Tony was stationed at our facility for an extended period of time to help manage the program and the supplier. When Tony entered the picture, conditions could not have been worse. Emotions were high, and frankly, no one wanted a "monitor". However, from the moment he walked in the door, things got better. Tony plowed through every issue that caused tension. He demanded that all parties focused on fact, not opinion. Each and every challenge we faced was met with simple rules, prove it. 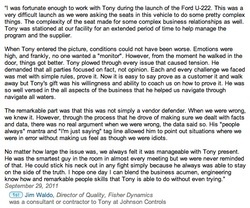 Now it is easy to say prove as a customer it and walk away but Tony's gift was his willingness and ability to coach us on how to prove it. He was so well versed in the all aspects of the business that he helped us navigate through navigate all waters. The remarkable part was that this was not simply a vendor defender. When we were wrong, we knew it. However, through the process that he drove of making sure we dealt with facts and data, there was no real argument when we were wrong, the data said so. His "people always" mantra and "I'm just saying" tag line allowed him to point out situations where we were in error without making us feel as though we were idiots.